Moreover, many writers, painters, sculptors, composers, etc. were born, lived, and flourished in Zakynthos; some of their creations can be seen and admired in the Museum of the town of Zakynthos. 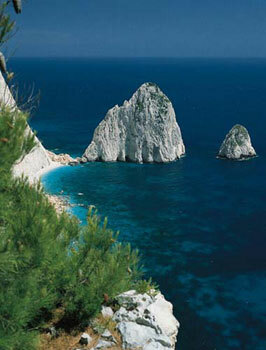 Zakynthos, moreover, is "home" of some rare species of sea animals, mammals, and birds. In this regard, the famous sea-turtle "caretta-caretta" is visiting the island every year to lay its eggs into the clean, sandy, hot beaches of Zakynthos. 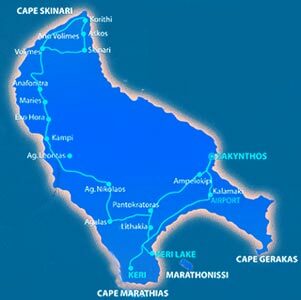 Also, the rare species of "monachus-monachus" lives on the sea-rocks and crystal-clear waters of western Zakynthos. It is for the protection of these rare animals and other fish and sea animals that the southern part of Zakynthos (the Gulf of Laganas) has been declared as the National Sea Park of Zakynthos. One of the most beautiful places in Zakynthos is the village of Keri and its sur-rounding environment, which is part of the National Sea Park. A wonderful combination of beaches, high sea-cliffs with "private" small and clean beaches, pine-forests, wonderful landscapes, velvet sunsets -The second most beautiful sunset in Greece- friendly, serene, and hospitable inhabitants, with strong local traditions, romantic music-lovers ("kantades") and tasty local cuisine, with envi-ronmentally friendly small-scale agriculture, olive-groves, vineyards and fruit-orchards. You will keep coming back every year!